Moto E4 Plus with 5000mAh battery visits FCC - AndroGuider | One Stop For The Techy You! A new Motorola handset carrying model number XT1773 has received FCC certification. The model is reportedly called Moto E4 Plus and is expected pack a beefy battery capacity of 5000mAh battery under the hood, and feature MediaTek's SoC. Just recently another Moto E4 variant with model number XT1723 was also cetrified by FCC revealing that the handset will feature 16GB storage and 4000mAh battery. This could be the Moto E4 Power. Besides, Moto XT1773 (E4 Plus) and XT1723 (E4 Power), FCC certified one more variant with model number XT1672, which is most likely the regular Moto E4. As per the listing, Moto E4 will feature 16GB storage, 2800mAh battery, 4G LTE, dual-SIM slots and run Android Nougat. 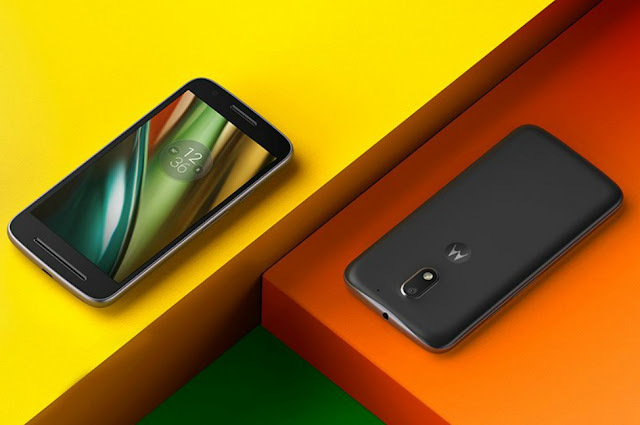 The Moto E4 line up will replace last year's Moto E3 series, that included the Moto E3 and Moto E3 Power. The Moto E3 had 5-inch HD display, MediaTek processor, 1GB RAM, 8GB storage, 8MP/5MP cameras and 2800mAh battery. The Moto E3 Power had somewhat the same specs, but camera with 2GB RAM, 16GB storage, and 3500mAh battery. Currently it is not known, when Motorola plans to unveil the Moto E4 line up. But its appearance on FCC, indicates that an announcement will happen soon.